My family has long tried to separate gifts from December 25th. It. Is. HARD. people. Do you remember my post from last year about the elf? Well, here we are a year later and Girly is still pretty much all in. I woke to the squeals of delight and joy a few mornings ago when Husbeau apparently placed our elf. She’s all in… the tooth fairy, the Halloween fairy (who takes their candy and swaps it out for a toy), some other fantasy characters that escape me at the moment and… Santa. 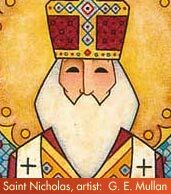 I love that St. Nicholas Eve comes so early in the month where we can talk about it and mull over it for days upon days before the 25th arrives. We can read stories and do good works. It sets the tone for the season above and beyond trying to explain the origins of the commercialized Santa Claus. We’ve had plenty of conversation about society’s misplaced priorities and the tools and figures advertisers use to exploit them. This is going to just be another one of those stories. When I was younger, I often stayed overnight at the neighbor’s house on St. Nicholas eve. We would put a shoe by the door and wake up to a Clementine in our shoe and maybe a few Swedish fish. I don’t remember. But it was exciting just with the Clementine. I have a lot of wonderful memories of that family, but St. Nicholas eve (and their inclusion of me in it) is a big one. Some where out there on the intarwebz, I saw that some families put their stockings up on St. Nicholas Eve as opposed to Christmas Eve. I really like that idea a lot more. I’m done with the stockings and frankly, we have no mantle here anyway. I’m eyeing up a metal stocking holder stand that I can sit in front of the fireplace, but I’m not sure. I always felt like stockings were totally pointless anyway. You can put small things in them, but they just wind up in the bottom anyway. What’s the point? And you can’t really just leave them empty… Anywho… This still leaves me with a fantasy character bringing them something overnight. BAH! Okayokayokay… no stockings on St. Nicholas eve. The goal is to highlight that St. Nicholas was REAL. There are so many things St. Nicholas was known for and I think next year, I want to start focusing on one of those areas each year. STOPPIT! I hear you chuckling at me from here. “Heather thinks she’s going to plan ahead for next year! BWAAAAHAHAHAHAHAAAA!” A girl can dream! She is completely crest-fallen that Santa is not real and that there are no reindeer to make cookies for and no magical man that will bring her one special gift that he can choose from her lists that are two pages long… BOTH SIDES (this is worthy of a whole other blog post). I’m not banking on this one. She rejects the transition of the real St. Nicholas into a fabricated and imaginary figure we know as Santa Claus and replaces it with her own explanation of how they are mutually exclusive. DING! DING! DING! This is what I fully expect. Because #Girly. Let me know what you’re thinking about all of this… How do you celebrate now? How did you celebrate when you were young? Let me read all of your experiences and ideas!